Probably Michael Thonet would have remained poor, if he hadn’t tried his luck in business far away from home. Many factors contributed to his success, which certainly would not have come to bear in the Middle Rhine Valley. 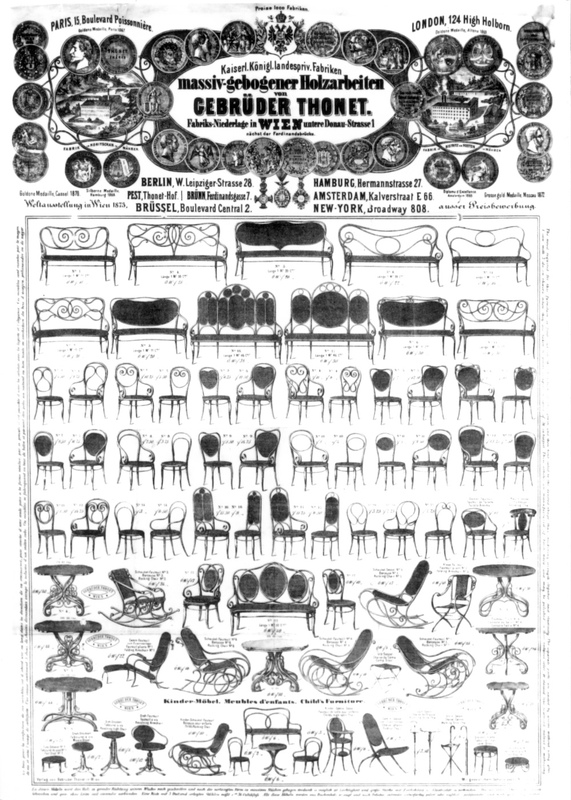 Firstly, thanks to his inventiveness, Thonet was able to work out a way of utilising techniques for his furniture, which lay way outside his trained profession. 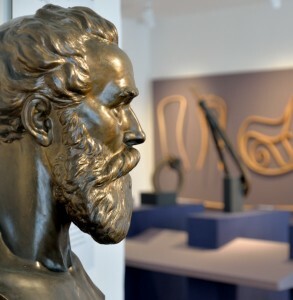 At the same time, he and his sons were successful in adapting the production of handcrafted individual pieces, via series production to mass production. In doing so, as a general rule, he didn’t fall back on the offers of machine producers already on the market, but developed, constructed and optimised his tools and machines himself. In addition he was the protégé of the Austrian State Chancellor Prince von Metternich and invited to Vienna, where the architect Peter Hubert Desvignes commissioned him to produce furniture for the Palais Liechtenstein. He also urged Thonet to present his products at various world exhibitions. Meanwhile his eldest son, Franz, was tapping new markets. Not only did he travel round European countries and set up a branch network, but he also founded the first American branch in New York as early as 1873. He reported home which preferences and needs the regional markets had, which a part of the production was geared towards. All of this only worked, because transport times had been considerably shortened due to the railways and modern shipping. To this effect the processes of bentwood production contained an additional advantage: the prefabricated individual pieces, once built, could then be taken apart again, packaged and sent like this to their destination. The final construction took place where the furniture was needed. For this purpose Thonet developed shipping crates, which for example with a cubic metre capacity, had space for 36 dismantled No. 14 chairs. 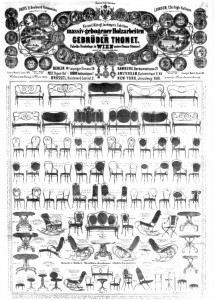 Finally Thonet benefitted from the fact that since the beginning of the 19th century, a middle class was evolving, which we would describe as mainstream middle class. This social group represented an important part of the market, along with industrial customers. Michael Thonet was born on the 2 July 1796 in Boppard. He was the son of the tanner and carpenter, Franz Anton Thonet, who came from Andernach. He took over his father’s carpentry workshop in 1819 and married the butcher’s daughter, Anna Maria Grahs in April of the following year. Thirteen children were born in Boppard as a result of this marriage. First the Thonets lived in ‘the Balz’, by a small square between the alleys, Steingasse and Pützgasse. 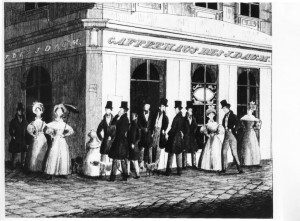 Before 1833 the family had moved into a more spacious property in Franziskanergasse. Thonet’s workshop expanded. Already in September 1837 he purchased, together with pharmacist Genius, the so-called Michelsmühle. There he ran a glue factory from December 1838 until September 1841. He himself was mentioned in the list of most highly taxed citizens of Boppard in 1841. In August of the same year he presented his furniture at a trade exhibition in Koblenz. So impressed was the Austrian State Chancellor Prince Metternich, that he invited Thonet to his Johannisberg Palace. In March 1842 Thonet placed an advertisement for five to six assistant cabinetmakers for his ‘factory of pressed furniture’. In September 1842 he is said to have employed ‘approx. 20 to 25 workers’. In this month he presented furniture at the trade exhibition in Mainz. Several drawn bonds with notaries in Boppard and Koblenz since 1838 point to financial difficulties. As the inventor of a process for making furniture out of bent wooden-veneer slats boiled in glue, he was unsuccessful in his attempt to patent the process in 1840. He also tried to apply for foreign patents and in doing so pay off his debts, but this too came to nothing. Therefore in the spring of 1842 he accepted Metternich’s offer to come to the Vienna court. During his absence, his eldest son Franz looked after the businesses in Boppard. In 1843 he organised the auction of his father’s property assets, paid off a part of his father’s debts with the 1246 talers earned in revenue and also travelled to Vienna. 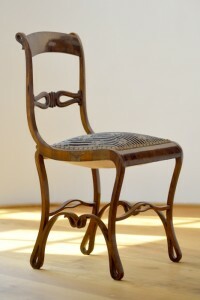 Boppard chair, manufactured between 1836 and 1840 in Boppard. Example of the early stages in developing the technique of bending wood. Biedermeier chair made from layer-glued bent wood and walnut veneer with an upholstered seat. The five layers of the lateral frame are of varying thickness, depending on the static requirements. When Thonet visited the Austrian State Chancellor Prince von Metternich in Johannisberg Palace in Rheingau in 1841, the latter advised him to start a new life in Vienna. ‘In Boppard you’ll remain a poor man’ his words are said to have been. 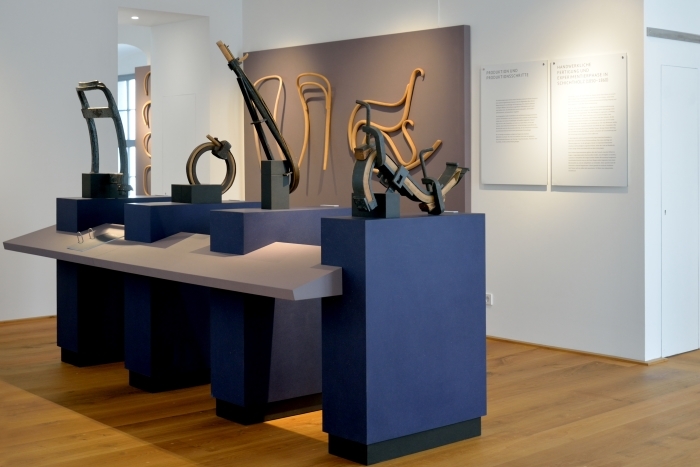 After his successful inaugural visit to the imperial courts, Thonet presented his glue-layer process to the Lower Austrian trade association. 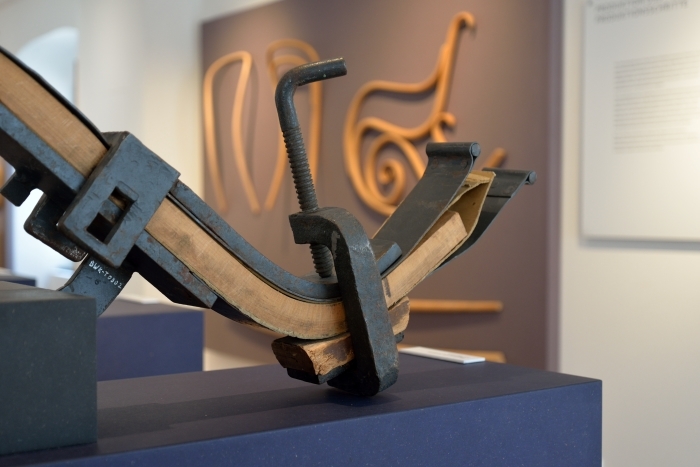 On the 16 July 1842 he received the Austrian patent ‘to bend any type of wood, even the most brittle, into the desired forms and curves by chemical and mechanical means.’ His family, who had initially stayed in Boppard, followed the father in the autumn of that year to Vienna. 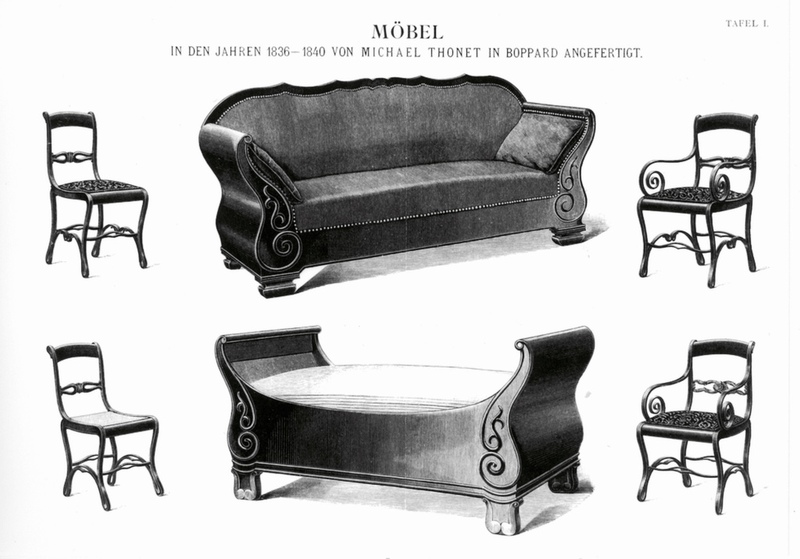 Initially Michael Thonet and his sons worked for the Viennese furniture manufacturer Clemens List. Through him they made contact with the English architect Peter Hubert Desvignes, who had been tasked with redesigning the Palais Liechtenstein. As the Viennese carpenter and parquet manufacturer Carl Leistler already had the general contract for furniture and flooring, the Thonets worked as his subcontractors. They produced elaborate parquet floors und a range of different chairs in the ‘second rococo’ style. With these models, which were made from three dimensional rods, bent and glued together, Thonet succeeded in making furniture with very elegant and graceful lines. 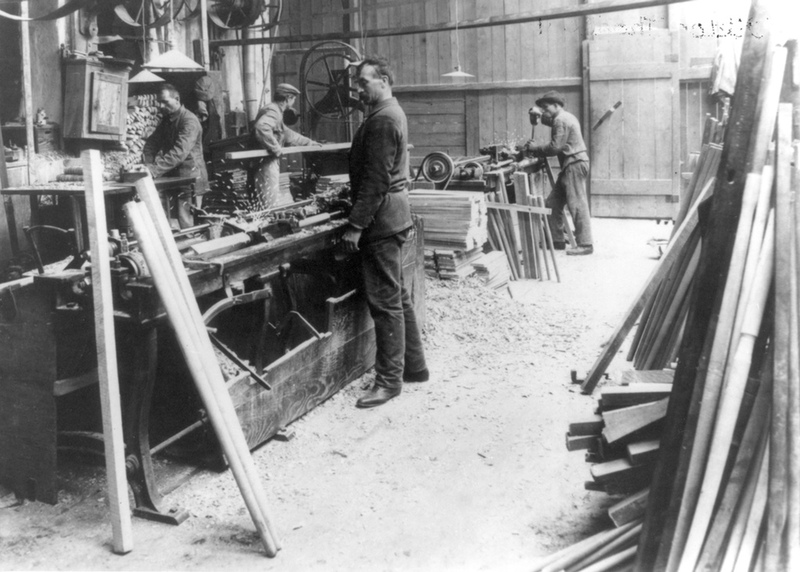 In 1849 Thonet opened his own workshop in Gumpendorf near Vienna, in which parquet flooring was made as well as furniture. 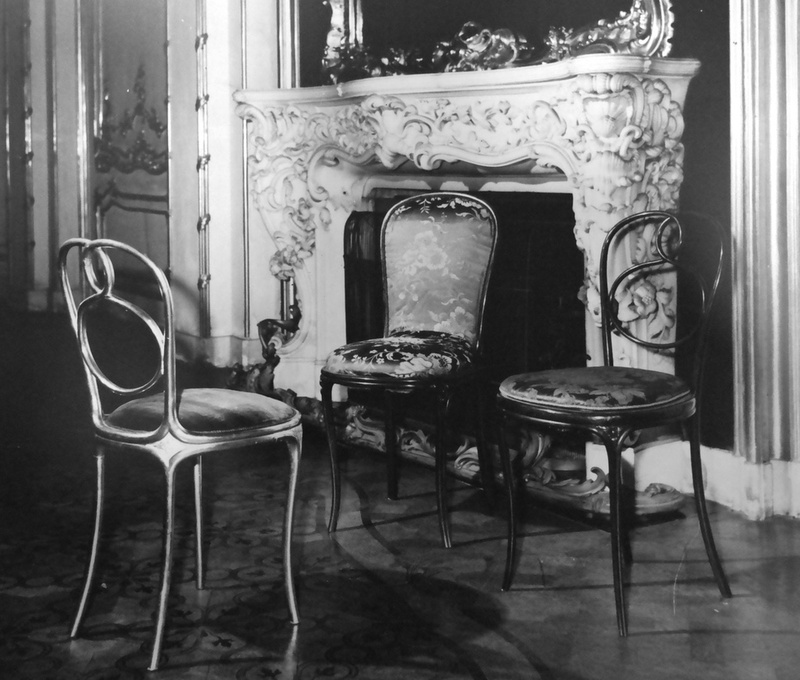 The chair which was made for the Palais Schwarzenberg in 1849 was and is highly elegant. It was later produced as No. 1 in the series. It is a simplified version of the Liechtenstein chair. Rear legs, backrest and motif no longer form one line, but the big loop of the Schwarzenberg chair is set into the back as its own motif. At about the same time Thonet developed the prototype for Chair No.4, with which he fitted out Café Daum am Kohlmarkt in 1851. With this model he widened his customer base of bulk purchasers. In July 1852 Michael Thonet applied for a patent for his bentwood process in the name of his five sons. The principle of ‘cutting and gluing wood back together to give it any desired bending and shape’ did not receive any recognition. In the same year he opened his first shop in Vienna. As early as in the spring of 1853 he relocated his workshop to Mollardmühle due to the healthy number of orders he had received. Here he employed 42 workers in total, including nine carpenters, a wood turner, eight veneer cutters, two gluers, eight raspers, two wood stainers, ten polishers and two workers who screwed the furniture components together. By the end of the year a four horse-powered steam machine powered the band saws and turning lathes. 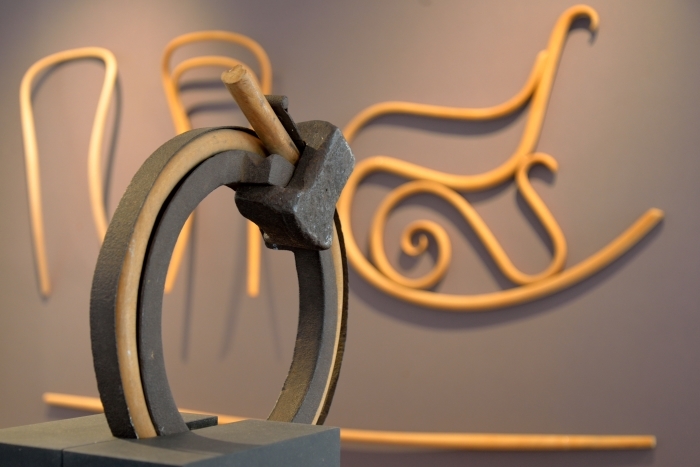 The new workshop represented a mixture of handicraft business and factory. On 1 November 1853 the company Gebrüder Thonet was founded. 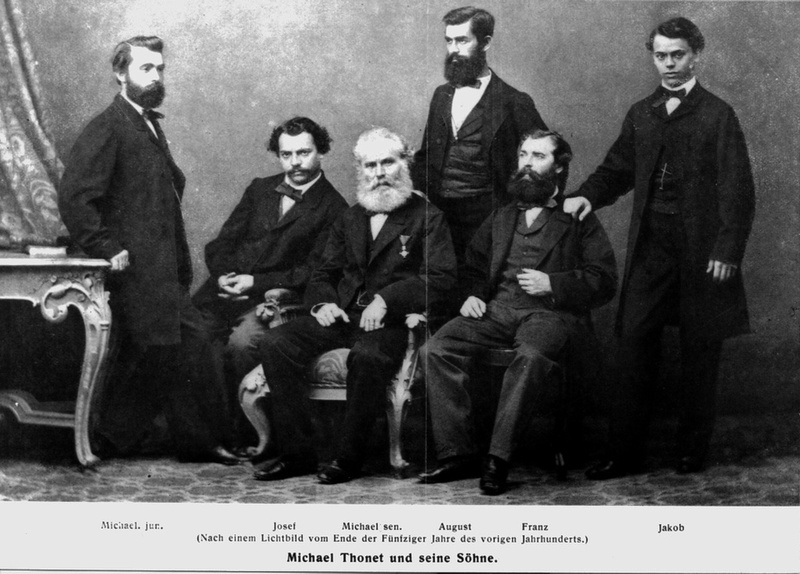 Michael Thonet transferred the business to his five sons, but reserved for himself the role of overall management and delegation for his youngest son Jakob. In the following years the new company presented its products in Munich and at the world exhibition in Paris. The first orders from abroad were placed. As the ordered pieces were exposed to greater humidity in tropical climates, the glue lost its adhesive strength, so that some pieces literally did come apart at the seams. After many experiments the attempt in 1856 to bend solid wood was successful: long, rounded-off pieces of beech were first placed in a steam oven, where they were exposed to hot steam for several hours to make them pliable. Finally a tin strip was placed on the external side of the bentwood, to avoid splitting. 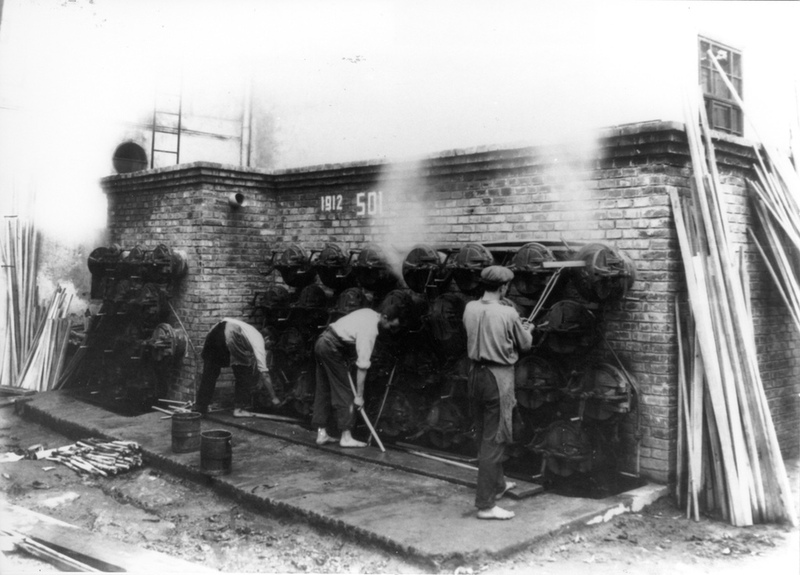 Then the wood was stretched in iron bending moulds. 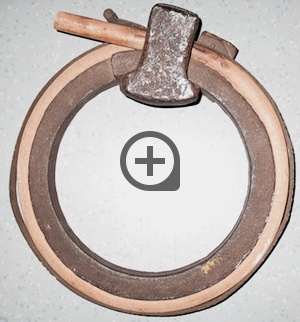 Thonet obtained a patent for this ingenious yet simple procedure in the same year. It led to an industrial breakthrough. 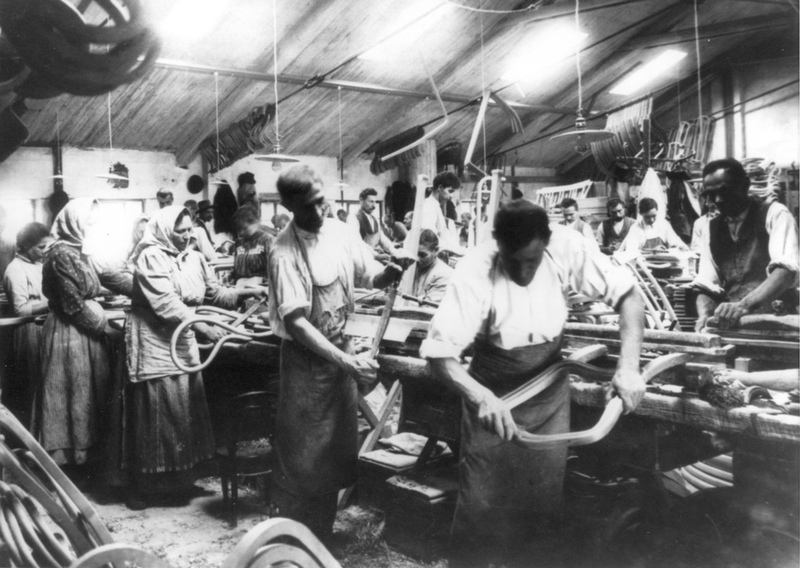 The organisation of work in the new factories corresponded to Thonet’s demand for a precisely organised process from the saw mills via diverse bending stations to assembly and packaging. Men carried out the heavy work, lighter tasks were carried out by young assistants and women, for half wages. 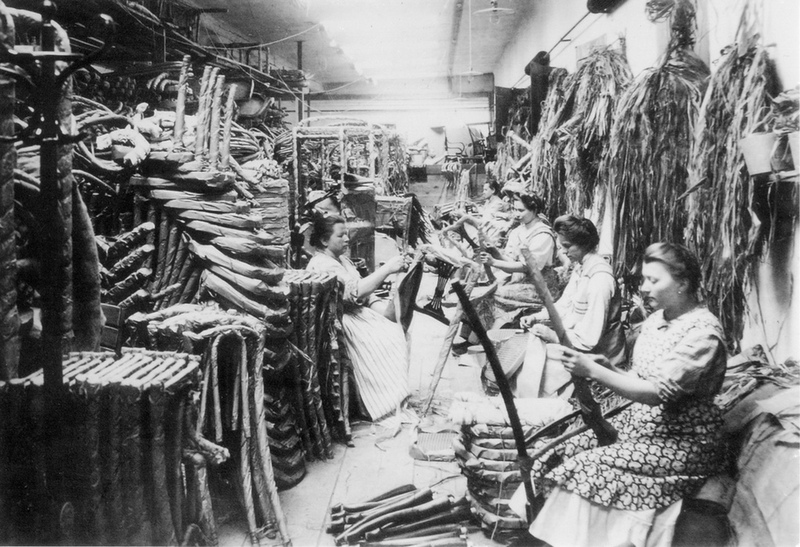 The cane plaiting, which was particularly labour intensive, was given a little later to home workers. The starting point for each chair component is a squared timber, free of knots and cut in the direction of growth. On the turning lathe it is either turned to produce a uniform thickness or using light compressions to produce round timber. Then it is placed in the steam oven and it is exposed to the hot steam for one to two hours depending on the thickness. A strip of tin is placed on the future external surface of the piece, to prevent splitting. Finally the wood is bent in a cast-iron mould. Apart from a few exceptions, the bending of the individual furniture components was done by hand. 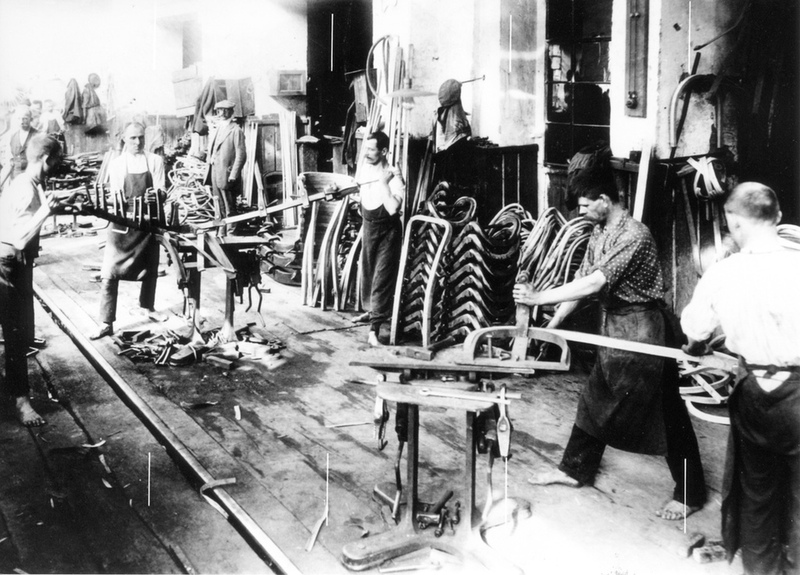 Only parts with a simple shape or with a larger diameter, such as seat rings, rear bolsters, bottom frames or table legs were bent by machine.